Oh, how I love the springtime! Everything around you is colorful. When we took an out of town trip last weekend, I was in awe with the beautiful colors of the flowers that we drove by. The spring green color of the grass and leaves gives a calming effect when you look at them. Not to mention the weather was to die for. The daughter of Jeff’s brother celebrated her 1st birthday on Saturday. It was a 4-hour drive from our place but the scenic route that we took was worth it. Then, while we were there, most of the time we spent it in their backyard and frontyard. Spring is indeed beautiful so it’s a shame to stay inside the house and not appreciate the surroundings. It made me think investing on some outdoor décor would give a boost to the already perfect spring effect. 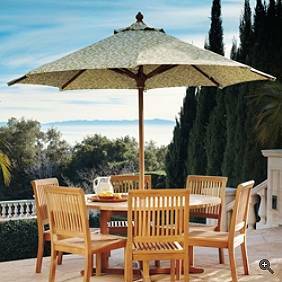 Who wouldn’t want to sit on the patio, read a book, drink a glass of juice or even chitchat with friends while you listen to the chirping of the birds and the sound of the crickets and cicadas. Perfect, isn’t it?